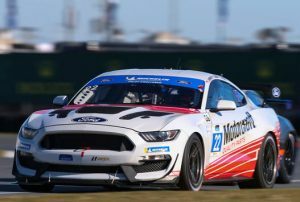 SEBRING, Fla. – Four drivers entered in this weekend’s IMSA MICHELIN Pilot Challenge race at Sebring International Raceway may be new names to sports car fans, but most are definitely not to NASCAR fans. Matt Crafton, Grant Enfinger, Ben Rhodes and Myatt Snider – all ThorSport Racing drivers in the NASCAR Gander Outdoors Truck Series – are entered with Ford Performance and Multimatic Motorsports for Friday’s Alan Jay Automotive Network 120 at Sebring. The opportunity comes as part of Ford Performance’s NASCAR Driver Development Program, which was first announced in 2017. The program gives road course experience to NASCAR drivers, as well as learning to work together, bond and depend on each other as teammates. This will be the first start in the Pilot Challenge for each of the four drivers and they sure picked one of the toughest tracks to make their debut, as Sebring has long been known for its bumpy and physically demanding surface. Matt Crafton, the veteran of the group and the first driver to ever win back-to-back Truck Series titles (2013 and 2014), knows that road course skills are crucial to have in NASCAR. Crafton will be co-driving the No. 22 Multimatic Motorsports Ford Mustang GT4 with Grant Enfinger, who currently leads the Truck Series standings by six points, three races into the 2019 season. In the No. 15 Ford Mustang GT4 will be Snider, the 2018 Truck Series Rookie of the Year, and Rhodes, who won the 2014 NASCAR K&N Pro Series East Championship and Rookie of the Year. The first on-track action the NASCAR drivers will see will be on Wednesday morning and early afternoon as part of a promoter test day. On the official schedule, three practices for the Pilot Challenge are slated for Thursday before qualifying that evening at 5:55 p.m. ET. The two-hour Alan Jay Automotive Network 120 goes green on Friday at noon ET and can be streamed live on IMSA.tv with IMSA Radio commentary. To follow along with the action, fans can use the hashtags #AlanJay120 and #IMPC.